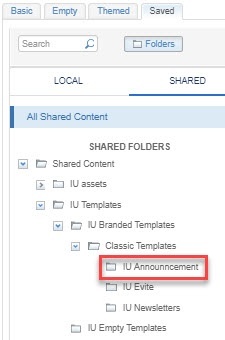 In the folder tree, go to Shared Content > IU Templates > IU Branded Templates > Classic Templates > IU Announcement. Find the announcement you want and click Select. Under "Define Email Properties", give the email message a descriptive name and select the local folder where you want to save it. Click Save. The IU Announcement template will open for editing. Give the email message a subject line and click Save. After entering the subject, click the save button that appears when you click into the subject field; otherwise, it will not save. The Indiana University general branding bar is applied by default. To change it to a campus-specific branding bar, see Change the branding bar for IU shared templates in Salesforce Marketing Cloud Content Builder. To edit content, hover over the area and click to edit. The preview is on the right side; the editing area is on the left. The editing area differs based on the content blocks defined in the template. Some content regions have preformatted placeholder text. To maintain text formatting, highlight text between the first and last characters and type your title. Delete the first and last characters of the old title. When you're finished, click Done Editing. Highlighting the entire placeholder text and typing new text will remove the formatting. 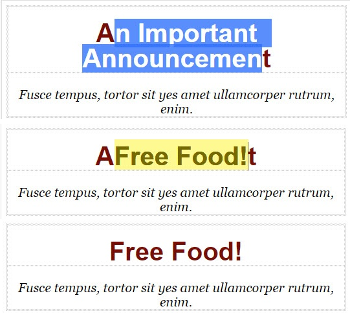 In the example below, the title is changed from "An Important Announcement" to "Free Food!". To add images, see Insert an image in Salesforce Marketing Cloud Content Builder Classic Templates. To remove content regions, you can clear the content block so it collapses and does not display in the send announcement. Click the arrow in the upper right corner of the content region and select Delete. Confirm the deletion. 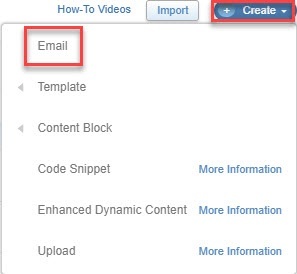 If you want to add content to the template, drag and drop content blocks into an area.